The heavy cotton canvas workwear is standard equipment for many countries’ petroleum, chemical, smelting industries, but in summer, stiff, heavy and airtight workwear always bring difficulties, with this kind of heavy canvas workwear, there are many factory workers who suffer from sunstroke. Although almost autumn now, the annoying hotness doesn’t go away from us. It is time to choose one light workwear in the hot summer for our diligent workers. So what kind of workwear do we need? What kind of clothing is more light, more breathable and at the same time with the good protective property? That must be the aramid overalls. Aramid overalls produced by Xnxiang Yulong Textile Co., Ltd. is made of aramid IIIA fabric, which is imported and blended with carbon fabric, so even light weight aramid overalls also have good FR and conductive properties. Light weight property, comfortable softness, high inherent protectiveness make it the best product for our customers in hot summer. 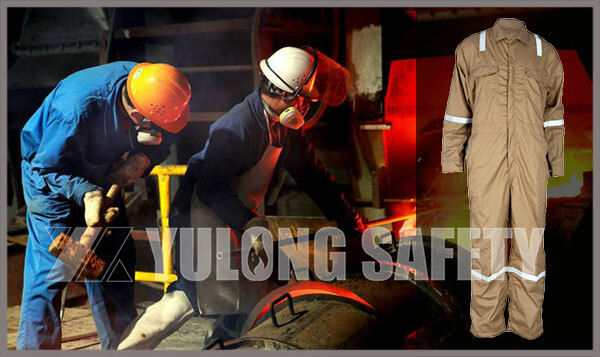 Choosing the high quality aramid overalls produced by Xinxiang Yulong Textile Co., Ltd. is to provide you and your partner a great security. our products, welcome to leave us your message.